Werkz Method is an office commissioned with the spatial concept of a store as well as a gallery and a studio space. The office conforms a box within a box concept. D’Marvel Scale’s strategy was to place emphasis on the intrinsic character of materials adopted. 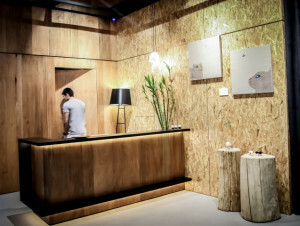 Different compositions of raw materials were used simultaneously to bring out the essence of the gallery. Some interesting materials implemented in the design includes raw wire mesh, oxidised metal frame and OSB boards. Looking at the double volume space and the regular form, it gave the idea of forming a mezzanine level to expand the use of this space. Hence, the concept of ‘box within a box’. We split the purpose of the space in that sense to allow smooth flow of work for our client. Coming in from the entrance, we placed the art gallery (public space) where customers can take their time and admire the different works, with a small seating corner. Then moving in deeper into the space, divided by a glass panel and concealed door, is the office (private space). With the mezzanine above the office is another office for the client’s use. The entire plan is clearly segregated in terms of private and public spaces. Speaking of aesthetics, we had the idea of using raw and recycled materials to create something new, giving life to old furniture. In order to blend with these raw materials, the interior hence move towards a more cafe – like theme where such materials are commonly used and where the colour scheme is similar. 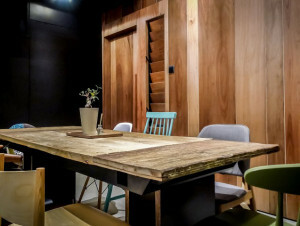 With that in mind, light fittings and other accessories were chosen specifically to help accentuate the old furniture.